Chef Stéphane Laruelle offers a modern and creative French cuisine at this affordable restaurant. : Over the years, Guy Savoy has transformed Le Chiberta into a creative yet affordable restaurant. 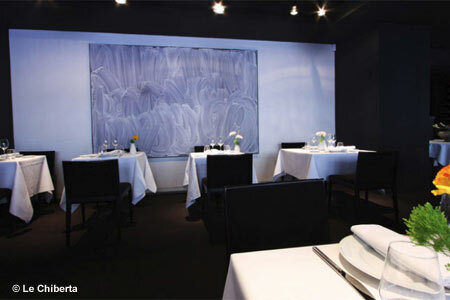 With chef Stéphane Laruelle, and direction by Jean-Paul Montellier, formerly of Le Bristol, Le Chiberta is the closest in spirit to Guy Savoy’s main restaurant in his name. The chef’s ambition is to offer modern and creative cuisine with a focus above all on the product. Thus, a delicate Bresse chicken with foie gras and artichokes in truffled vinaigrette, and tuna with bergamot, red onion marmalade and citrus-fennel preserve. The sautéed girolle mushrooms paired with shavings of Iberian lomo ham is a simple dish that highlights the flavor of these two exceptional products, while for dessert, the grapefruit terrine with Earl Grey sauce is an outstanding play on textures. Le Chiberta’s décor was imagined by architect Jean-Michel Wilmotte, who also designed restaurant Guy Savoy. A spectrum of subdued colors and contemporary materials express the conviviality that is Savoy’s signature. À la carte, from about €100 (without wine); tasting menu €110.